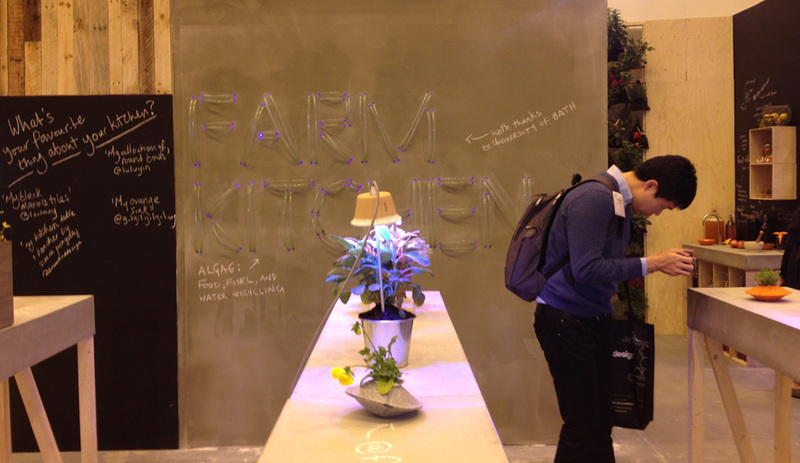 The U.K. design studio Mette has set up Farm Kitchen at 100% Design, an inspiring exhibit that illustrates the growing trend toward indoor farming. For the micro-agriculture environment, the studio has brought together a host of designers and manufacturers, including Gaggenau, that are investing in the idea that many of us will be growing our own food one day and utilizing our kitchens as miniature horticultural hives. The participants base their vision of the future on a growing collective awareness about the eco-friendly benefits of localized food chains and a widespread desire for healthier, pesticide-free produce. But home farming isn’t easy. It involves tasks like harvesting algae as a source of bio-fuel and setting up hydroponic irrigation systems. 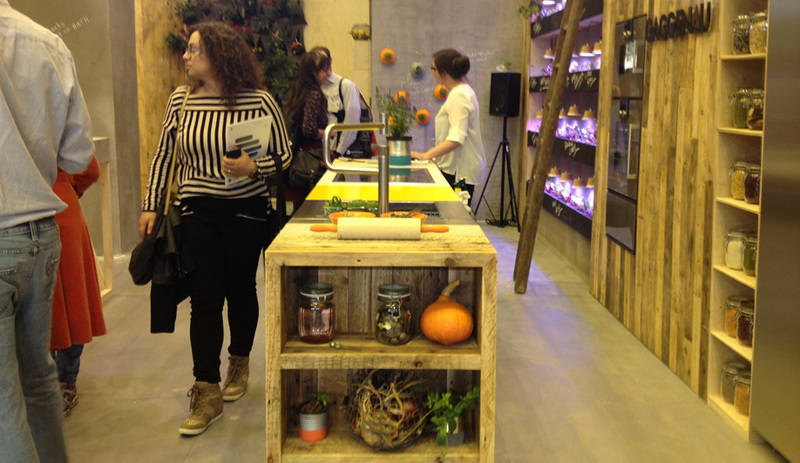 For this exhibit, Mette turned these lab-like methods into an actual kitchen that’s beautiful and inspiring. 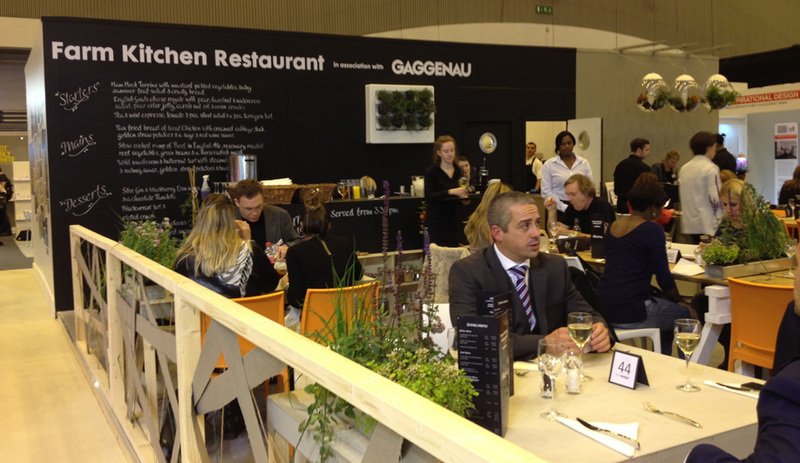 The studio’s own Chop & Change modular kitchen, initially launched at 100% Design last year, is at the centre of the display and is kitted out with appliances by Gaggenau. 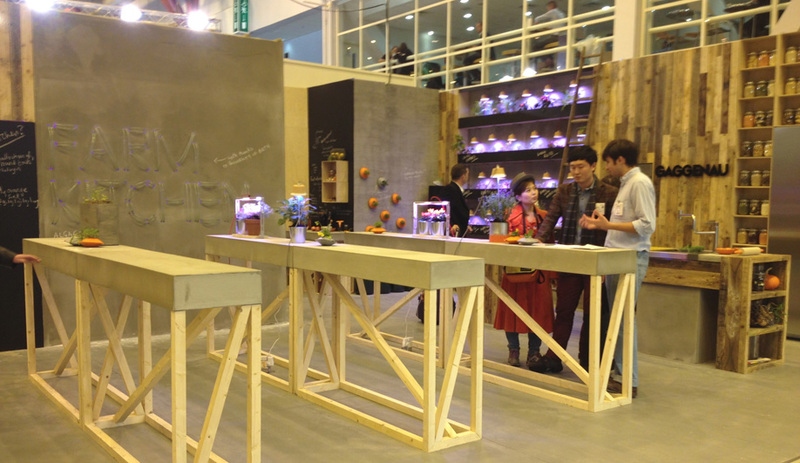 The customizable modular design combines various surface materials, such as concrete, distressed wood and tile. For an algae farm, Mette removed any messiness by inserting their growing tanks behind a wall. Only some of the clear plastic funnelling tubes are visible, in this case spelling out the words Farm Kitchen. As the algae grows it can be seen flowing through the tubes. 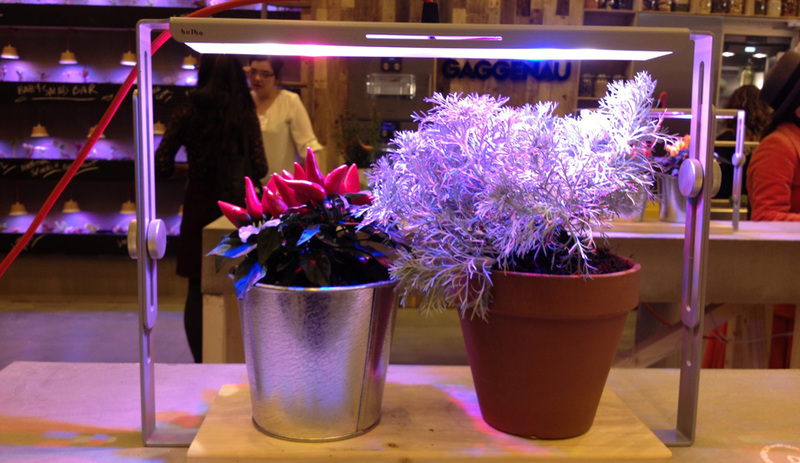 The Bologna studio Bulbo has successfully developed a tabletop planter called Quadra, with growing lights that produce the ideal conditions for vegetables and herbs. It consumes a mere 14 to 21 watts, which is about the same amount of energy needed to keep an alarm clock running. 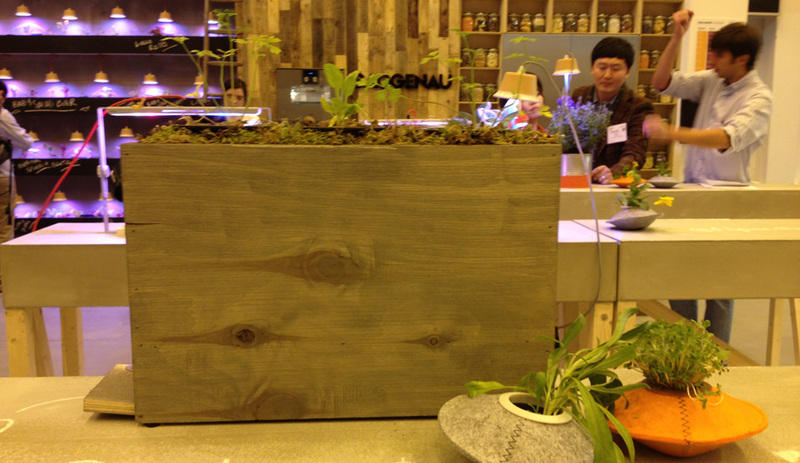 This wooden box is embedded with a built-in irrigation system that maintains consistent moisture for plants. 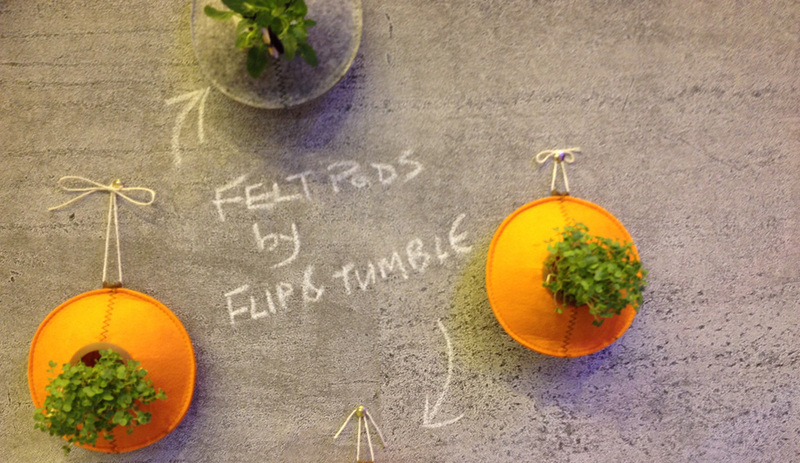 The plastic-lined Felt Pods by Flip & Tumble are designed for growing small batches of herbs and can be placed on tabletops or mounted to walls. 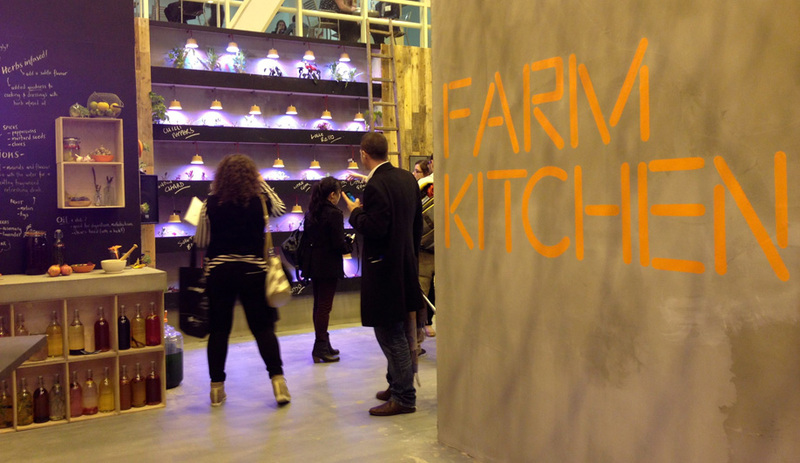 100% Design attendees were invited to eat lunch next door, at the Farm Kitchen restaurant. While the food isn’t being made in Mette’s demonstration kitchen, the menu includes locally sourced produce.